Well nothing unless you were giving this reply above to this : Anyone know how long EIYX will be in lima romeo for? Lots of multinational naval traffic coming in on ais in the Clyde /Glasgow area,seemingly a two week exercise "joint warrior" is kicking off this weekend.Quite a few are Supp/logs ships suggesting subs and RAS. 1,666 boardings in 2010, with 70 warnings & 8 detentions. Thats about one boarding per patrol day. L.E.Aoife just got a bollicking on VHF from Port of cork for speeding in the channel. AIS shows them doing 15kn where you are supposed to drop speed to 5kn. The Voice on Aoife apologising to the Cork Harbour radio did not get much sympathy on this very public admonishing. [QUOTE=Goldie fish;359587]L.E.Aoife just got a bollicking on VHF from Port of cork for speeding in the channel. AIS shows them doing 15kn where you are supposed to drop speed to 5kn. Cork Port ops in no position to bollick for speeding given that a few years ago the pilot cutter doing 22 kts sliced into a Yacht which had right of passage ,the Sonia. The Lord Mayor of Dublin, Cllr Andrew Montague along with the Flag Officer Commanding the Naval Service, Commodore Mark Mellett will be on board the Naval Service vessel L.E. 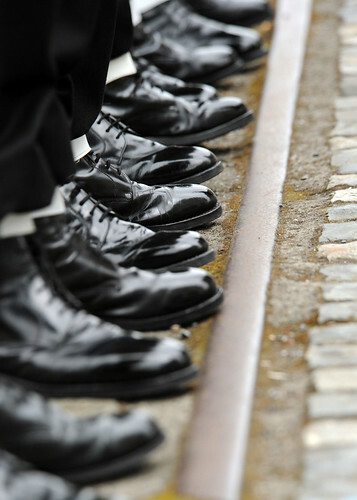 RÓISÍN for the Command Handover Ceremony on Dublin's Sir John Rogerson's Quay on Friday the 1st of June 2012 at 4pm. L.É. RÓISÍN was adopted by the City of Dublin in 2000 and has maintained a strong connection with the City since. 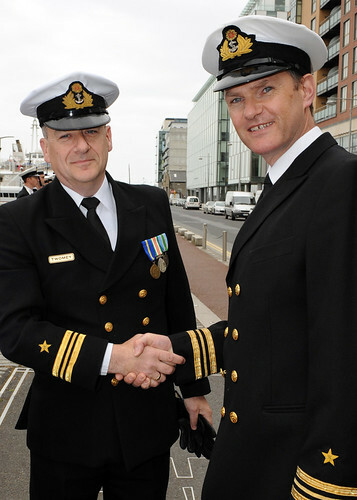 Lieutenant Commander Terry Ward, who is originally from Dublin, will take over command from Lieutenant Commander Peter Twomey. That's right, I thought it was a mistake first. FOCNS currently inspecting Crew of L.E. Emer at keyside in Cork. I heard a ball hop, The Angola Navy has put a bid in for LE Emer, I will try to seek more info..
Look in the OPV replacement thread, your ball hop is in the right region. Angola Owes us. We cleaned up loads of their landmines in the 90s. That said, isn't germany about to gift them a few fast attack craft? How to traverse the River Lee. Never seen it look so good. Watch as the first man through the hatch trips over the bulkhead. Some videos of the NS in action. And they wonder why flying helos from PV sized vessels was dangerous. That's a CPV (seems to be coping with the conditions but I wouldn't like to be on board). The HPV is double the displacement.